Hello there! I’m so excited to share with you how this simple Board and Batten treatment has completely transformed our dining room! If you follow me on Facebook and Twitter you’ll know what I’ve been busy at work on my dining room makeover. Step 1 has been to spruce up the walls with a board and batten treatment. This is such a straight-forward and simple project – anyone can do it. The most time-consuming part is painting, as always! Paint brush, roller, painter’s tape, drop cloths, etc. *Don’t forget to allow your wood to acclimate to the conditions of your room for at least 5-7 days before using it. Otherwise it will warp or crack. The dining room is the second darkest room in our house (the office being the darkest) so I was looking for a wall treatment that would really brighten up the space. I researched many board and batten tutorials before starting this, including the one Young House Love did as well as Thrifty Decor Chick. These tutorials helped me figure out the easiest way to go about things without making too much work for myself. 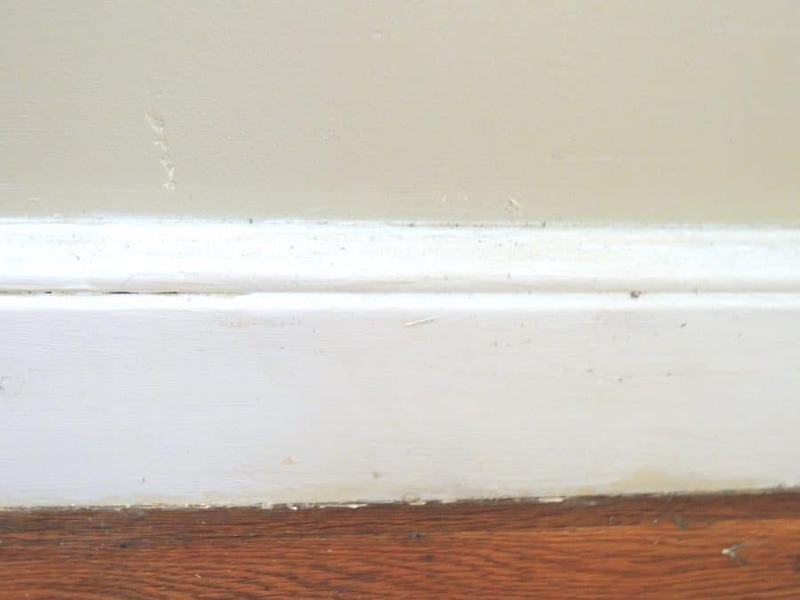 The first issue I came across was my baseboards, which needed to be straight to allow the battens to sit on them, but mine had a decorative piece sitting on top. 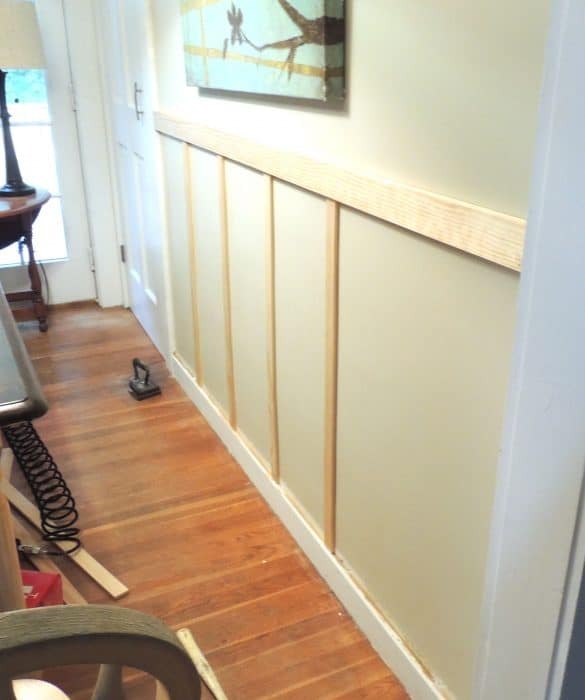 Luckily, it was an added detail so I was able to pull it right off and save the baseboards….PHEW! If I would have had to replace all the baseboards, this project would have been dead in the water! Now that I knew that it was possible to go ahead with the project, I headed to Lowe’s to pick up my supplies. I decided to stick with what John & Sherry from YHL recommended and got a 1 x3 for the top rail and for the battens I grabbed a bunch of “craft wood” that was 1.5 inches wide and 3/8 of an inch thick. All the wood purchased was pine because it tends to be smoother and not warp as much. At that point I hadn’t quite figured out the spacing (I was debating whether to do 12 inches apart or 16 inches apart) but I knew they needed to be 33″ long (and they came in 36″ lengths so that worked out great). We let the wood acclimate to our dining room conditions for a week before proceeded with nailing them to the wall. So, it turns out that I’m kind of a scaredy-cat when it comes to the nail gun. Luckily for me, I have a fantastic hubby who likes to play with the nail gun! Using the level to keep everything straight and at the correct height, the top rail was quickly installed. The corners were done using the trusty miter box. Not perfect, but nothing a bit of caulk can’t fix! And now to the not so fun part. Prime…prime…and prime again. After the first coat of primer I spackled the nail holes and caulked the seams. I find that paint covers a lot of sins, so I tend to wait to spackle until I have one coat done. 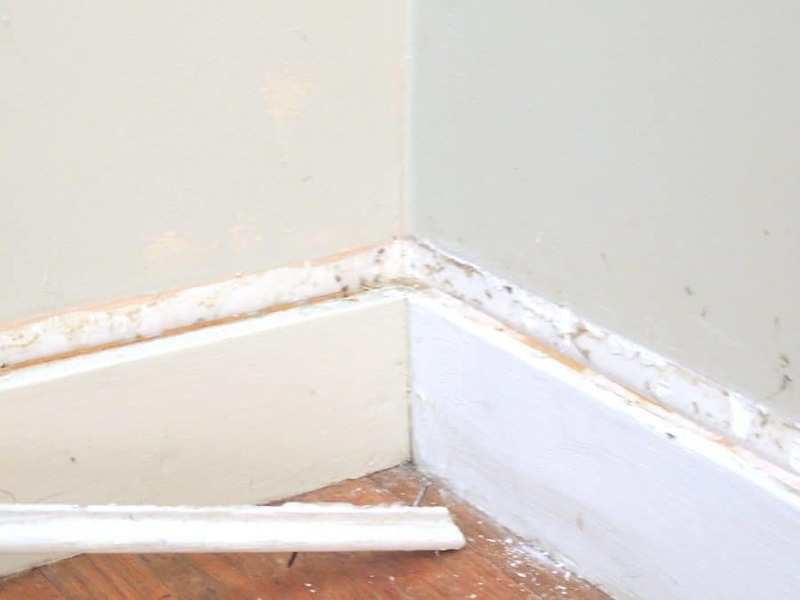 After sanding the spackle (remember, spackle can be sanded, but caulk can’t – so work neatly!) I applied another two coats of primer. Fresh wood really soaks up primer, so you’re better off doing an extra coat if it looks like it needs it. I used a paintbrush to get into the nooks and crannies, and smoothed everything out with a roller. Does it totally change and brighten the entire room? The board and batten will eventually run up the entire length of the stairs – but that project is for another time. It requires everything to be cut at a 40 degree angle, so it’s a little trickier since our miter box doesn’t cut at that angle!